Dri-Ref™ reference electrodes were developed by WPI to have extremely low electrolyte leak­age properties. In addition to this key feature, these electrodes exhibit stable and reproducible potential and low resistance. Stored in KCl when not in use, they have a long life expectancy. Although the internal filling solution con­tains KCI, the low flu­id leakage means Dri-Ref may be used in combination with ion se­lec­tive elec­trodes, in­clud­ing those for K+ and Cl-, without sig­nif­i­cant con­tam­i­na­tion from the reference elec­trode. 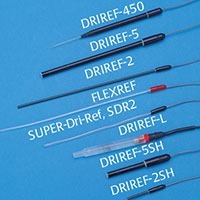 The Dri-Ref electrodes are chemically re­sis­tant to strong acids and alkalines. Dri-Ref electrodes are not suitable for use in organic sol­vents. In ad­di­tion, the long, thin FLEXREF may be easily ma­nip­u­lated to ac­com­mo­date a difficult ex­per­i­men­tal setup.